-The service is available to both feature phone and smart phone customers through USSD and MyAirtel app. Airtel Payment Bank, India’s first payments bank, today said that its customers can now make card-less cash withdrawals at over 100,000 ATMs across India. IMT is accessible to all Airtel Payments Bank account holders through USSD (*400#) and MyAirtel app. 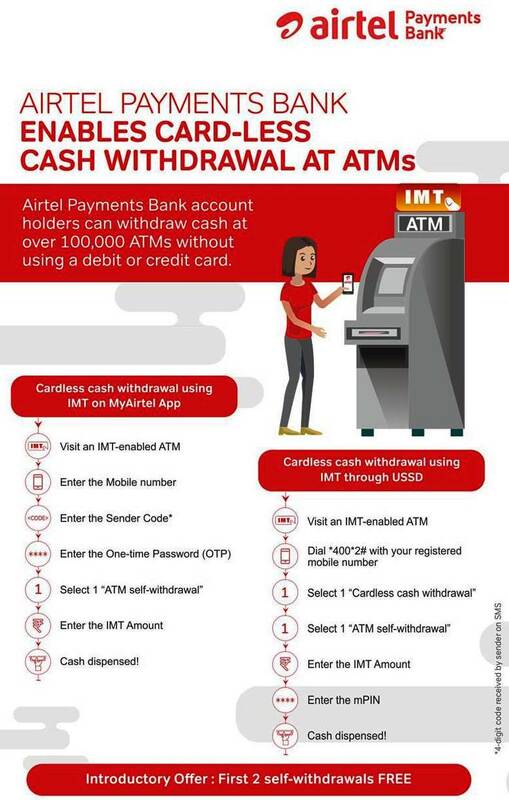 The customers can generate a cash withdrawal request which can be used for withdrawal at any of the IMT enabled ATMs. As an introductory offer, Airtel Payments Bank has waived off Rs. 25 transaction fee for the first two self-withdrawals.